The biggest night in Hollywood and I'm going to be silent. Normally I make my predictions and live blog during the event, but as of 6:50 p.m. I have no plans to and probably for a silly reason. Uggie the Dog stole every scene he shared in "The Artist" and for the Academy Awards people didn't extend an invite to the pooch. They hand invites out to Zac Efron and Sasha Baron Cohen like they're Skittles, but for a key performer in a movie nominated for Best Picture, they get nothing. I have my list of predictions ready to be posted the moment I hear from my sources that Uggie either graces the red carpet or is seen on stage, but until that moment, I will remain silent about the Oscars. 10:10 p.m. -- I was just informed there was an Uggie the Dog sighting, so here we go. Announcing Best Musical Score and I predicted "The Artist" will win. I will post a list of the remaining main categories that are left. 10:20 p.m. -- "Man or Muppet" wins for Best Original Song. I predicted that one as well. I need to thank Uggie for keeping my predictions from being posted until now. Let's just say I wasn't on my game early in the awards. 10:27 p.m. -- Alexander Payne, Nat Faxon and Jim Rash wins for Best Adapted Screenplay for "The Descendants". This one was a given for me. Although "Moneyball" and "Ides of March" was really good as well. 10:30 p.m. -- Woody Allen wins for "Midnight in Paris" for Best Original Screenplay. It was original back when it was called "Annie Hall". Just kidding, Woody. It's nothing like "Annie Hall" and that's why "Midnight in Paris" didn't deserve to win. I wonder if the Academy can write off that charitable gift? The Best Actor category is killing me. I loved Brad Pitt and Jean Dujardin, but I think they're going to go with George Clooney. I would love to see an upset though. 10:52 p.m. -- Best Director goes to Michel Hazanavicius for "The Artist". Well deserved. "The Artist" is one of my favorite movies of the year. Terrence Malick's "Tree of Life" was pretty amazing too. 11:15 p.m. -- Jean Dujardin wins for Best Actor! I picked Clooney, but I'm so happy Dujardin won. "The Artist" is a great movie that everyone needs to see. 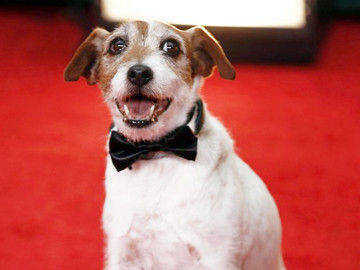 I'm hoping if they win "Best Picture" that Uggie is up on stage. 11:27 p.m. -- Best Actress goes to Meryl Streep for "The Iron Lady". Not too much to say here. Everyone kept talking about Viola Davis in "The Help", but I think she was more of a supporting actress and that ended up hurting her. The big one is up next. Best Picture. 11:36 -- "The Artist" wins Best Picture! If you haven't seen it, you have no idea how awesome. Uggie's on stage! Of course stealing the show just by looking cute.